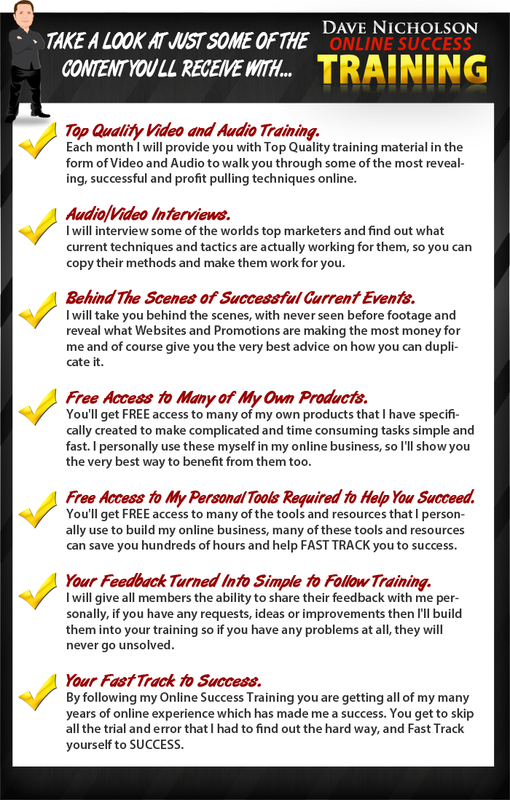 John Thornhill and Dave Nicholson's Online Success Training Package | Monthly Training For Serious Individuals Seeking Online Success! THIS IS YOUR FINAL OFFER! I'm sure you already know that things are constantly changing in the world, and the online world is no different, each and every day there are new and better ways of doing things being devised. In this day and age you must constantly MAINTAIN and BUILD on your business, as well as keep up with current events and changes, otherwise you are destined to FAIL! If you've spent your hard earned cash and precious time building your business, then it makes sense to KEEP BUILDING and IMPROVING on everything you do, or no matter what stage you are at FAILURE is inevitable. Even if you haven't yet started to build an online business, and you're just starting out, you still need to learn all the techniques, systems, strategies and tools that will ensure your success. We've basically taken all our EXTENSIVE knowledge over my many, MANY years as SUCCESSFUL online marketers and built it into our Online Success Training Programs that have all the latest and greatest methods that anybody needs to ensure their success. Each and every month we'll add BRAND NEW up to the minute content into our members areas that we have PERSONALLY tried, tested and PROVEN to REALLY WORK ONLINE. So there you have it, you can see that we are really serious about this, and you can see that we are putting everything into ensuring YOUR SUCCESS, not just for now, but for the future too! To PROVE we are in this to help YOU, we have teamed up to offer you BOTH of our VERY SUCCESSFUL online training programs with all our experience, tools, products, help and support for the VERY SPECIAL price you see below. Remember, we're offering to FAST TRACK YOUR SUCCESS and to ensure you BUILD a SUCCESSFUL business, whether you are starting from SCRATCH, or NOT! So grab BOTH of our online success programs right now, and we'll look forward to showing you exactly what you need to do to be REALLY SUCCESSFUL. Hopefully we'll see you on the inside! Copyright , John-Dave.com.com. All Rights Reserved.